Raffaello Sanzio da Urbino, known in the art world as Raphael, was an Italian artist of the High Renaissance. Raphael worked as an apprentice for painter Pietro Perugino, where he learned about drawing, using art mediums to create anatomies of human figures, paint chemistry, and various techniques of applying paint onto wood or canvas in smooth layers. The High Renaissance period of art (1490’s – 1527), was characterized as a period of exceptional artistic production in Italy. This period’s artists had ambitious scales, complexity of composition, closely observed human figures, decorative references to classical antiquity, or an idealized vision of the past. Raphael not only became a master of artistic technique, but in his thirty-seven years of life, produced an amazing amount of expert artistic works. 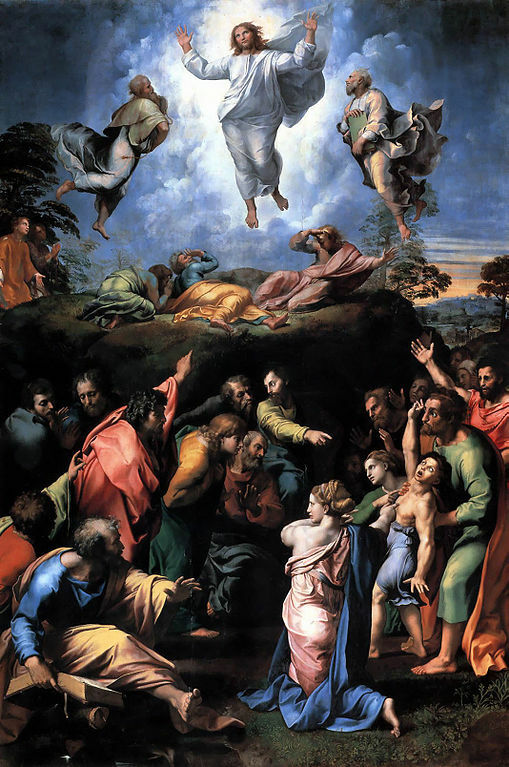 Raphael’s work of art, Transfiguration, was created beginning in 1516, and was thought to be finished by his student of art, Giulio Romano in 1520, after Raphael’s premature death. Cardinal Giulio de’Medici (who later became Pope Clement VII), commissioned Raphael to paint Transfiguration for the city of Narbonne, in France. The painting was kept personally by the Pope after Raphael’s untimely death, until he donated it to the church of San Pietro in Rome. The painting is now housed in the Vatican Museum. This artistic composition is divided into two distinct parts. Transfiguration relates to successive stories of the Gospel of Matthew. The upper part of the painting depicts Christ elevated in front of billowing, illuminated clouds, and on either side of him are the prophets Elijah and Moses. In the lower portion of the painting, the Apostles are depicted, trying unsuccessfully, to rid the possessed boy of demons. The upper portion shows a transfigured Christ, appearing to be performing a miracle, curing the boy, and ridding him of the evil. On the most obvious level, the painting can be interpreted as the split between the flaws of men, depicted in the lower half, and the redemptive power of Christ, in the upper half of the painting. There are two figures kneeling to the left of Christ are the martyrs, Saint Agapitus and Saint Felicissimus, who were deacons seized during the persecutions of Emperor Valerian. Transfiguration‘s dimensions are 159 inches by 109 inches. Raphael preferred painting on canvas, but this painting was done with oil paints on wood as chosen mediums. Raphael actually showed advanced indications of Mannerism, and Baroque period techniques in this painting. The stylized, contorted poses of the lower half figures indicate Mannerism. The dramatic tension within these figures, and the liberal use of light to dark, or chiaroscuro contrasts, represent the Baroque period of exaggerated motion to produce drama, tension, exuberance, or enlightenment. Transfiguration was ahead of its time, just as Raphael’s death came too soon.